Japan was hit by a devastating 9.0 magnitude earthquake on March 11, 2011 that resulted in a massive tsunami wave that reached an estimated 40 meters (131 feet) in height. With both the earthquake and the subsequent tsunami being one of the largest recorded in human history, around 16,000 people died and 3,000 people went missing after the incident. Yet that was not the end of the tragedy, the tsunami caused a meltdown in the Fukushima Daiichi Nuclear Power Plant, and the associated evacuation zones affected hundreds of thousands of residents. The Reminders Photography Stronghold is hosting Japanese artist Mayumi Suzuki's breathtaking new exhibition titled, "The Restoration Will." It is about the story of her family who went missing after the tsunami, including her father who was a studio photographer. One of the two sections of the exhibition contains damaged portrait images from his ruined studio. We see 13 images on the wall, and while some of them are in good condition others were damaged during the disaster and it is hard to see the faces clearly in the photographs. Mayumi scanned a few of the damaged images back in order to add another layer to her father's portrait photographs that were ruined by the water that rushed in during the tsunami. It feels like the summary of the incident in Japan; some people died, some people are still alive and some people went missing. The second section contains the images shot by the artist after the incident in the region. 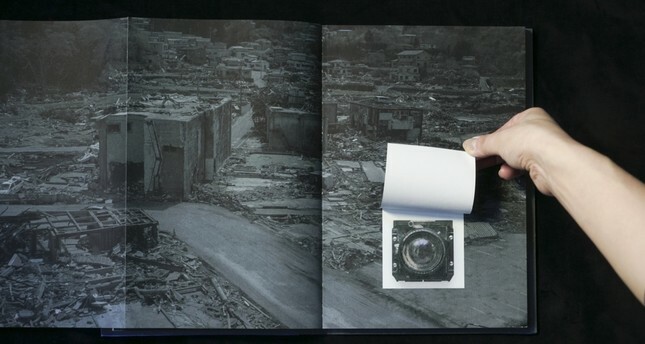 Mayumi created a camera with the lens that she found in her father's ruined studio. It was the lens that her father used to shoot the portraits in the first section. In this section, she combines the photographs with the damaged footage from her childhood shot by her father. There is a strong relation between memories and time in this section. She traces the time of the photographs, knowing that the one who took the photographs is already part of the past. The way Mayumi deals with this personal and intense subject is quite special. Without any intervention she used the broken lens that was used by her father in his studio. She didn't even clean or fix the damaged lens, with soil that came with the tsunami still clinging on inside the lens. Cameras used in photography work similar to our eyes. In order to see an image on your camera's sensor or film, you need a lens that can transmit the light. She documented her city through what she calls her father's "eye." "I believe that objects have a soul and the ones used by us take a part of us and keep it," she said. Perhaps this lens was one of the objects that Suzuki's father touched a lot during his life. Suzuki became a mediator of her father's eyes with the camera that she created from worn parts that typical photographers would not touch. Most of the time photographers focus on the other peoples' issues. Somehow you can manage to build up an objective relationship. However, in Suzuki's case it is hard to do that. How do you deal with your family's absence? It is unquestionably tough. The dominant atmosphere of the show is sadness but the ambiguity of the images makes it less sad than it would normally be. In the exhibition we only see a couple of images about the tsunami's physical effects but they are black and white, over contrasted and not sharp. It is hard to see the details. I see this as an intentional choice because we have already seen more than enough images from the zone. For the artist there is no reason to show them again and no reason for us to look at them again. Mayumu Suzuki is presenting a handmade photobook next to the exhibition to help us see the tragic story in a broader context. It doesn't show the images directly within its unique design. The photobook is designed based on our intention to open folded pages to see some images or to follow the texts that is embedded to some of the pages of the book. It is a personal story, and if you are curious you open the folded pages. This yields a unique interaction with its spectators. For instance one of the pages that I opened was about the artist's last conversation she had with her family on the phone. The sadness that dominates the exhibition continues within the book, transforming itself into an emotion of shock. However, surreal images help us calm down after certain pages. She uses the same camera that she created with her father's lens to produce the images. Most of the time, they are out of focus because of the worn lens, however, it adds an incredible layer to the project. It helps her produce images that sway between worlds of tangible and intangible and the abstraction of reality enables us to make a connection with her work. I believe that if the photos were sharp and not out of focus it would create distance between the photographs and the viewer. Photobook making is hype among photographers; therefore, the quality has become really mediocre. Photobook projects that have a strong relation between the form and the content that I find valuable and strong are rare nowadays. Mayumi Suzuki's "The Restoration Will" is among those rare valuable projects. Reminders Photography Stronghold gallery is runn by Japanese photography curator Yumi Goto in Tokyo. The gallery aims to make multi-photographic activities, like exhibitions, workshops, and photographers in residence and publishing possible.